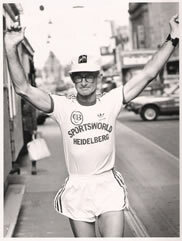 The season's longest race, held in honour of VCCL and ultra running legend George Perdon. No aggregate points to be awarded for the 6.5km event. Members: $20 before Saturday, 20 August 9:00pm. Trophy and bonus $300 kindly donated by Keith Lofthouse. Sash and bonus $250 kindly donated by John & Julie Hertz.